ISO-Mat Metal is a condensation and drainage system for metal roofing. 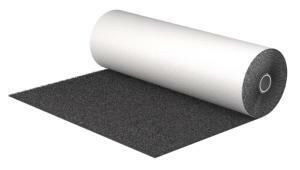 ISO-Mat Metal is a fully vapour permeable, strong, durable and waterproof barrier. ISO-Mat Metal incorporates a breathable membrane base with an additional layer of spiraled polypropylene mesh melt bonded to it, which has been designed as a moisture and separation layer for all types of standing seam and metal roofs. Available in 25m x 1m rolls.